Patrick Campbell Lyons formed Nirvana in the still-swinging London of the late-60s, together with Alex Spryropoulos. In 1968, signed to Island Records, they charted with 'Rainbow Chaser', a classic slice of pop psychedelia. After achieving short-lived success, Patrick decided to pursue a less structured direction and signed to the fledgling Vertigo label. In 1970 his solo album 'Local Anaesthetic' was released. In spite of this, and also work as a talent scout and producer for the label, Patrick remained restless and in 1972 sailed to Majorca on a friend's boat where he got together songs to be featured on his second solo album 'Me And My Friend'. Released in 1973 on EMI's Sovereign label, it features Bobby Harrison and Micky Moody (who formed the band Snafu) and former Nirvana cellist Sylvie Schuster. 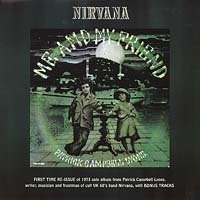 This CD reissue is complemented by the inclusion of bonus tracks from Nirvana's 1972 album 'Songs Of Love And Praise'.